dirty snow, originally uploaded by jahansell. I guess what has happened is that, over the winter, we had snow, which got covered with a layer of dirt, then more snow, then more dirt, and on and on. 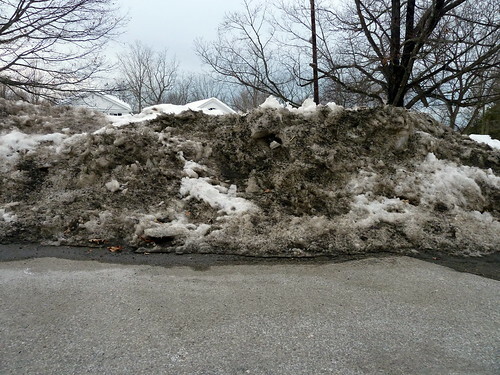 Now that the snow is melting, it's as if the frosting between layers of a cake disappeared, leaving only the cake, or in this case, the layers of dirt. On my back porch where I feed the birds, the whole history of the winter is now revealed - the plates I put out in December, the suet feeders from January, the orange slices, the tens of thousands of sunflower seed hulls - all were covered up by successive layers of snow, and now all are revealed -- it's an ugly sight indeed. It is kinda ugly, but it is a sign of Spring all the same!